A true homo universalis, Michelangelo was a versatile and innovative painter, sculptor, architect and poet. He worked for the most distinguished patrons of the time: the Medici in Florence and Pope Julius II in Rome. Michelangelo lived a long, fruitful life. His prolific output and the high reputation he enjoyed during his lifetime ensured that many of his works, notably drawings, have survived. 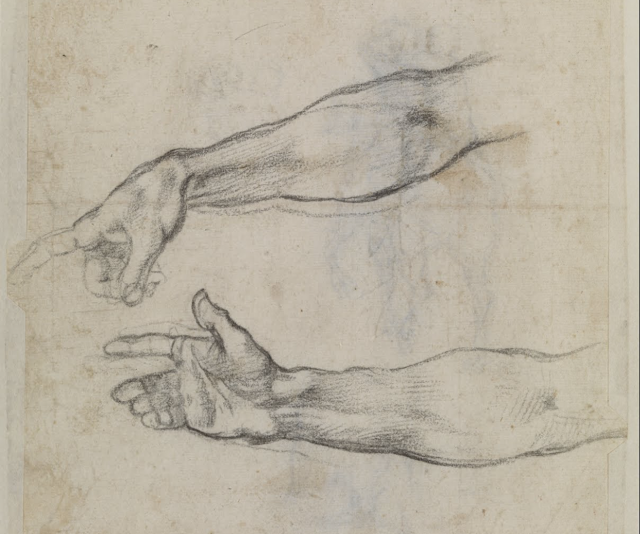 The museum has three Michelangelo drawings. This sheet has sketches on both sides. On one side are two forearms. They were preparatory studies for the raised right arms of Noah’s sons, who appear in the right section of the fresco, The Drunkenness of Noah, on the ceiling of the Sistine Chapel in the Vatican. Michelangelo was experimenting with the position of the arms and hands, as we see from his corrections to the contours. The muscles and sinews are done with hatching to make them look realistic. Michelangelo would certainly have been working from a live model. At upper left on the reverse of the sheet is a sketch of two naked horsemen, and a variant of the same motif. This was probably a study for a detail, which was never executed, for one of the fresco paintings in the Sistine Chapel. Michelangelo drew another study, that of a male torso, after rotating the sheet 180 degrees.